The corpse waits in the Lych (Corpse) gate for the priest to come to it and start the ceremony. I have not found any online references to the ‘folk’ belief I somehow gathered as a child. 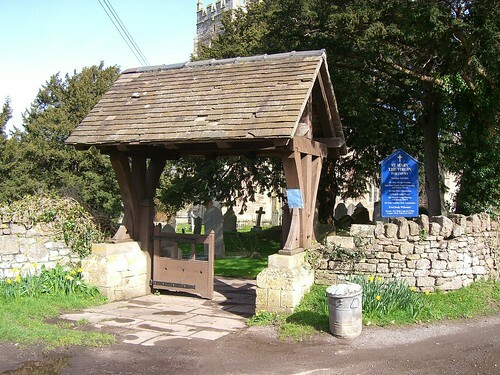 My folk belief is that placing the corpse down in the lych gate somehow stopped evil (pagan?) spirits riding the body into the concecrated grounds of the churchyard. This scribble was published on Monday, March 26th, 2007. You can follow any banter on this scribble with the RSS 2.0 feed. You can leave a response, or trackback from your own site. Ladies, I realize this is a very old post, but I saw a Lych Gate yesterday in Fruitland Park, Florida, USA . It was at the Holy Trinity Episcopal church. Mary Alice, I am curious as to the other one in Florida. Do you know what city it is in? I read there are only two in FL. Hi Kathy~ Fruitland Park is just around the corner from me. I was a part of the Colonial Dames 17th C. group that recognized the Lych Hate a few years ago. The other Lych gate in Florida is called “Lichgate on High Street” and I believe (all my research is packed away right now…) in Tallahasee. I have not yet been there. Have you been to other Lych Hates Kathy? Thank you Mary-Alice. Fruitland Park is actually close to me also. I live in The Village of Pine Hills. I have never seen another Lych-Gate that I know of, but could have seen one, just not realized the purpose. I do visit cemeteries for a website called Find A Grave. I had never even heard the term before. I learned quite a bit by visiting the Holy Trinity Episcopal Church last week. Happy Lych-Gate hunting to you Mary Alice.